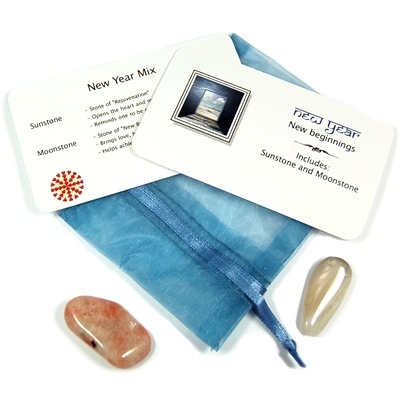 Tumbled New Year Mix - 2 Piece Set in Pouch – This is a special limited edition, Tumbled New Year Mix we created just for the new year containing two different tumbled crystals. 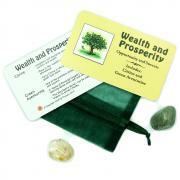 They have been placed in a sheer blue or yellow organza pouch with a beautifully designed reference card which details the properties for each stone. They will make great gifts throughout the new year. 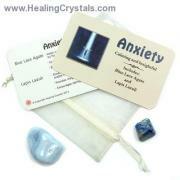 Each pouch contains 1 extra large Tumbled Moonstone and 1 extra large Tumbled Sunstone. The vibration of these crystals is lovely and the polish is beautiful. Reminiscent of moonlight, this tumbled Moonstone glows with cream, peach, and pearly gray color, and is partially translucent. Moonstone is the perfect compliment to Sunstone. It is a stone of new beginnings, new ideas and new creations. 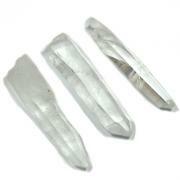 Moonstone, like its companion Sunstone, also brings good fortune and abundance. 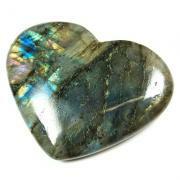 Moonstone fills us with love, hope and happiness. This Sunstone is from India and is a gem variety of Feldspar. Sunstone is known for its iridescent reflections or "flash" when it catches the light. Sunstone is an amazing, shimmering stone of rejuvenation. Sunstone opens our hearts and minds to new, fresh and creative ideas, lifting the spirit and reminding us to have fun with life. 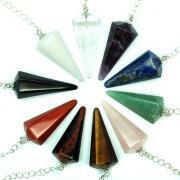 Sunstone also represents the energy of good luck and abundance.